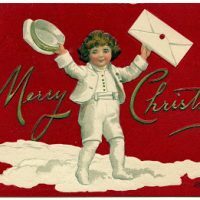 This is another darling Retro Christmas Image! 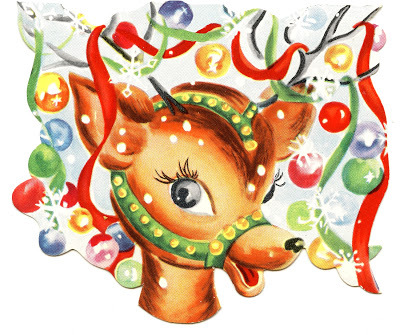 This one is a colorful cute Reindeer! He looks so festive with all the streamers and ornaments hanging in his antlers! This is another one from the 1950’s – 1960’s Christmas Card box that I picked up recently. You can find another graphic from this collection HERE. Really cute! But I can’t download it, it says the image contains errors? So darling thanks for posting. I have to make something out of this cutie! Adorable but can’t get the image…goes to next screen and Red X appears in the box. Are you guys still having trouble downloading it? It’s working fine for me. Maybe blogger was having a glitch earlier. Love this image Karen! Thanks so much for providing such wonderful images! OMGosh this is FANTASTIC! Thank you for posting it. I can’t download it either…just goes to a blank screen and image never loads. Thanks, it’s a great image!! Ok, I just uploaded him again. Hopefully he will work for you guys now, but please let me know if he doesn’t! Thanks Karen – he is so cute! Unfortunately still not working for me, and I’ve tried two different computers. I just added a link to a Printable PDF file for this one. So for those of you that are still having trouble, just click on the link and you can print the file from there. Wonderful. Thanks so much for sharing. Thank you for letting me know Laura, I will check it out. You are very sweet to look after me! This is so colourful – very joyous! Thank you for sharing this really cute image! Thanks Irene, I just love the Retro images!